Back at the end of 2009 I was sent a few products from Clinique’s skincare range to test, including the infamous three step system. I have since then become pretty loyal to the skin care range, finding that when I try other brands my skin doesn’t seem to happy. 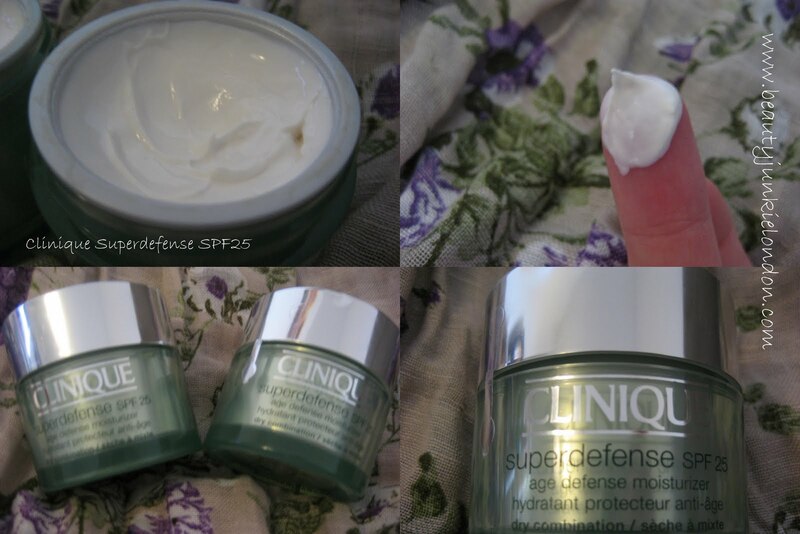 Beyond the three-step program, I also tested a selection of products targeted at more specific issues/protection – one of which being the Superdefense SPF25 moisturiser. When I first reviewed this I wasn’t exactly won over, as I found the texture to feel a bit gritty. I did note that it was probably down to a dodgy batch rather than a poor formula – and as such when the PR from Clinique read the review she offered to send me another to try to make sure I had a fair opportunity to form an opinion. Sure enough, when I got testing the second pot – I found the formula totally different and not at all gritty. In all other ways it was just like the first time round, but with a smoother texture. To read more about what I thought first time around click HERE. Some may wonder why – if I was testing this out in 2009 – is it only in April 2010 that I am getting around to writing about it? Well, this is because (as bad as this is) I don’t love using moisturisers with SPF in during winter, hence why I have started using it regularly now Spring has kicked in, needing SPF daily has come back onto my radar. I do constantly suffer from a bit of guilt that I don’t wear SPF everyday, as I know I should, especially since I have absolutely no excuse for not doing. I guess I am just drawn to moisturisers that I like and they don’t happen to contain SPF. But now the sun has reared it’s wonderful head again, I know I need to wear SPF, so this has become my standard day cream. Do you use SPF daily? If so, what’s your favorite?? Tell me more! For the past few months I’ve been trying to wear an SPF religiously each day. I have extremely sensitive skin and lots of SPF’s seem to irritate my skin. I’m currently using Aloe Soothing Moisture Lotion SPF 15 as I find that range suits my skin. But in a month or so I’ll be looking for a higher SPF for the summer (if we ever get one this year!). You are the first person I have come across to rate the 3 step system – when I tried it years ago – short term benefit was good – but the alcohol and other stuff in the toner made me run a mile. what’s your view on the ingredients in the toner? I prefer to have an spf in my foundation rather than my moisturser. at the moment using mac foundation and concealer both of which have very high spf. you still haven’t reviewed the product! Now feeling very guilty of the lack of SPF in my life. Note to self – MUST WEAR SPF EVERY DAY. @Stephanie – forgot to include the link to the last review with more details. Basically the only thing that’s different from the first one is that it doesn’t have the gritty texture. Will add the link in now. Enjoyed your review. I have been using Superdefense for 4-5 years. I love it because of the SPF. I am keen on watersports and live in a hot climate. SuperDefense seems to continue to work whereas suntan lotion washes off plus I can go easy on the suntan lotion on my face as the latter brings me out in spots despite being over 50!. Recently thought I’d try a slightly less expensive product as the Clinque range is far more here than in the UK but it was thin, messy to apply, doesn’t go as far and didn’t give the sun protection I was used to – you get what you pay for so I’m sticking with Clinique. @susie I have to agree. I have come to like this cream more and more with use. Plus, I used it every day on holiday and my face didn’t burn once – even when I managed to badly burn my back, as I forgot to re-apply cream my face was still protected (and I hadn’t re-applied there either) – so that alones give it top marks from me!